Things have been very quiet on the blog and my Instagram lately, but I promise you they have not been so quiet around the house. We moved into the new house a couple of weeks ago and are officially Floridians now. We are loving our new surroundings, and it’s starting to feel more like home everyday. I promised myself I wouldn’t touch a single box in my sewing room until every other box in the house was unpacked and (somewhat) organized. Things got unpacked pretty quickly. I was missing my sewing machine and dying to set up my new sewing room. As soon as I am completely finished with my new sewing space I will share photos, but for now I am glad to be organized enough to at least be able to sew again! 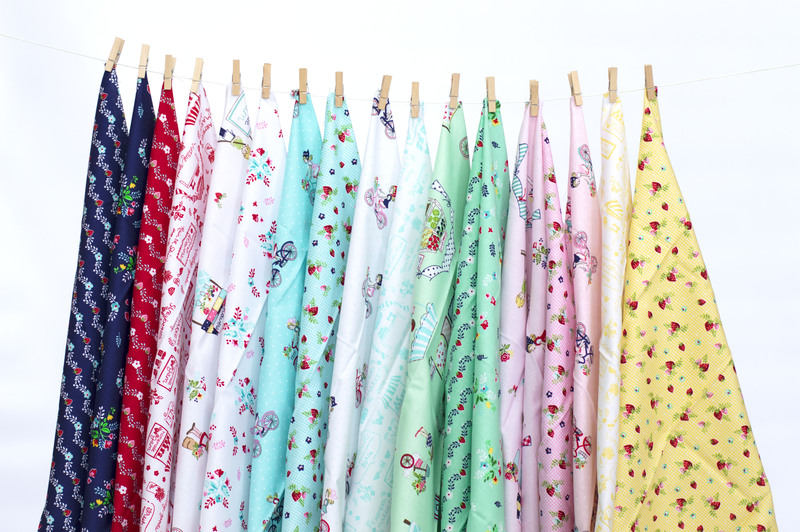 There seems to be so many amazing new lines of fabric out right now, but I have to say Tasha Noel’s new line “Vintage Market” is sitting at the top of my favorites. 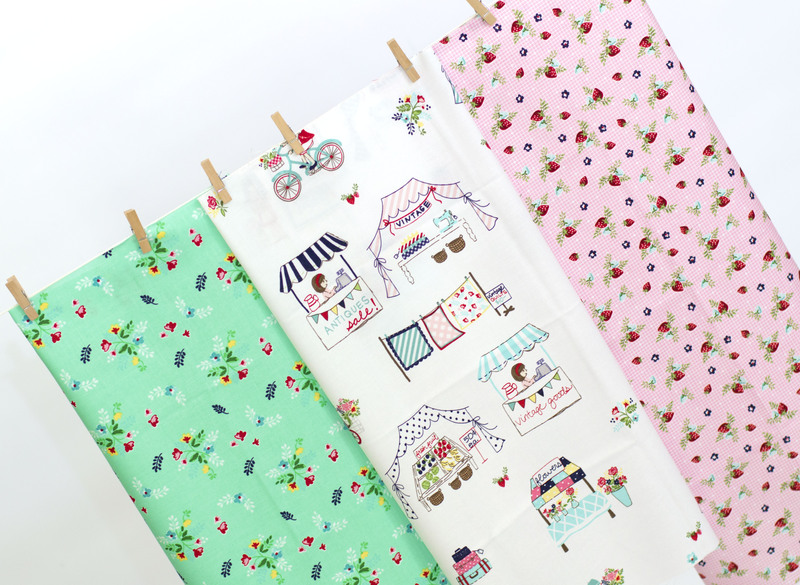 There isn’t a print in the collection that isn’t simply adorable, and her little characters are so endearing. 2. 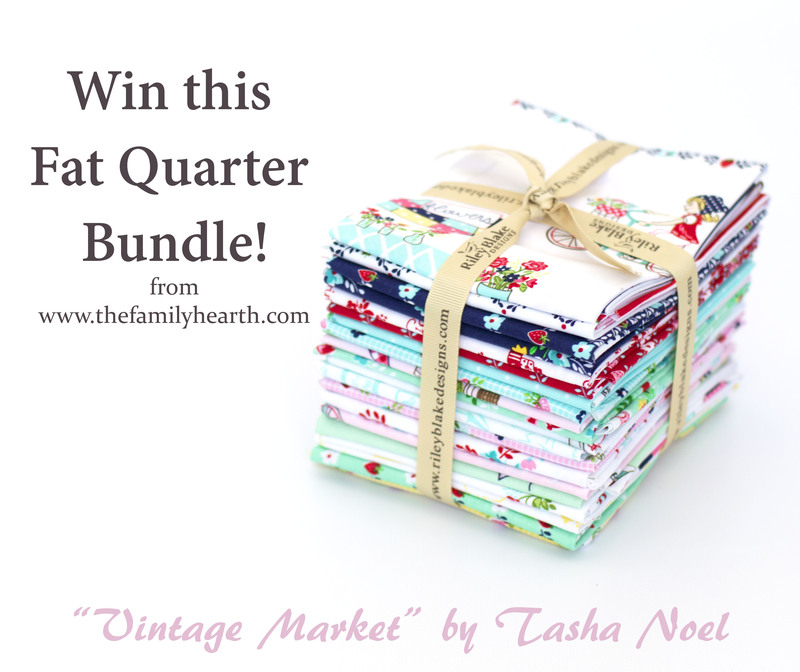 Follow me on Instagram @bellbridgette and repost my picture of this fabric bundle with the hashtag #thefamilyhearthgiveaway. You can find my picture of this bundle on my Instagram wall. This giveaway is open to all! (Yes, even internationally!) I will randomly pick the winner this Sunday, July 12th, at 12 noon EST. Beautiful collection!! I would make a quilt! Vintage Market would be perfect for fabric baskets, to hold kitchen towels, hand towels in the bathroom, or even baby items like burp cloths. What soothing bundle. Bridgette it’s wonderful to meet you and I’m so glad you got to sew already…the organization of your sewing room can come later:) Thanks for sharing. This fabric is so awesome!!! 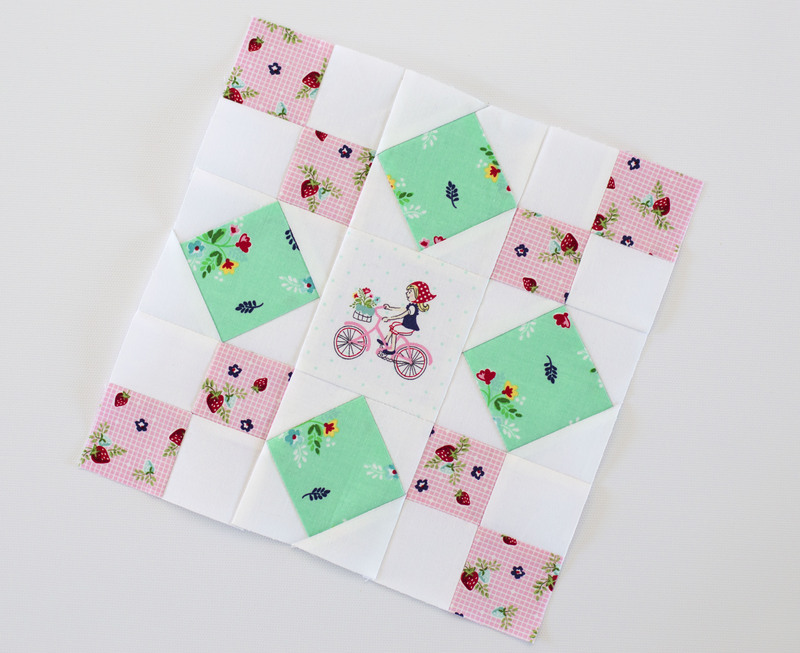 I would love to make my brand new niece a baby quilt! Thank you for the giveaway! Love these. I think I would make a quilted bag. This is so pretty – the aqua floral is my favourite but I do like the strawberries too. I would use it either in my charity sewing projects or to make a gift, as I just heard this week that my friend is having a baby. Oh I would so love this bundle! I absolutely love this line and want a bolt of it all! I would start by making some stitching pouches to take my supplies with me while I am on the go! I would make a quilt…. I think with the Fireworks pattern. This collection is so beautiful! 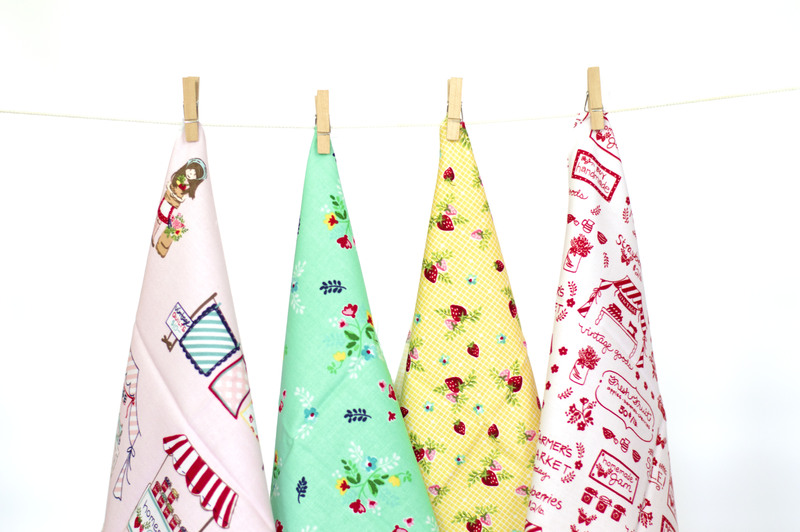 Would be wonderful to have the chance of sewing with these lovely fabrics. I would love to use it to make bags for my daughters. I would have to make something cute for my granddaughters bedroom. I am thinking pillows or pouches. Other than “make a quilt” I don’t know. 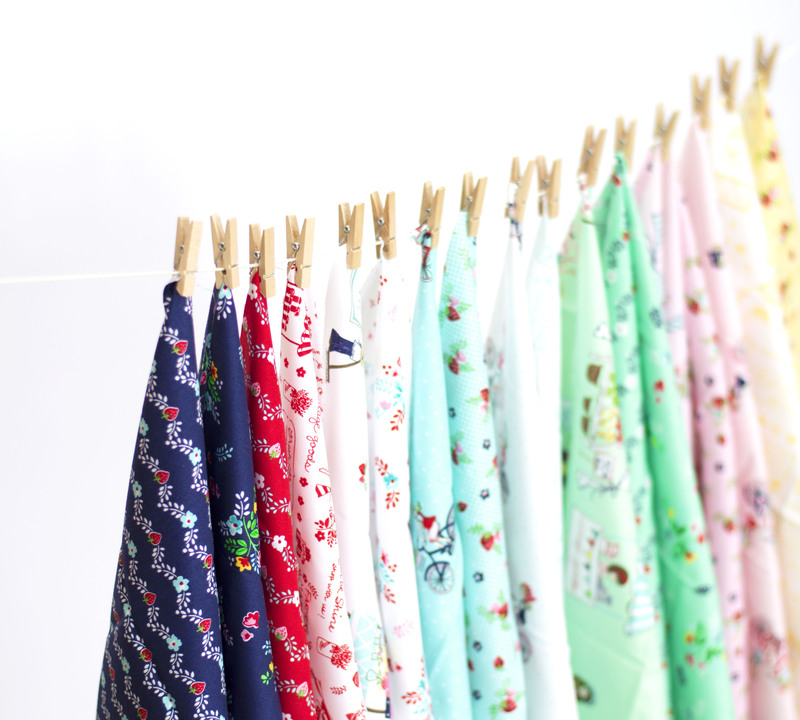 The collection will make a very cheerful lap quilt. I’d make a quilt for my niece’s daughter, Danielle. The fabrics are perfect for her! Congratulations on getting your house set up! I like you method of using sewing as motivation! 🙂 I would use these wonderful fabrics in a lap quilt. Thanks for the chance to win! So cute! I would make some adorable pillows for my couch (and probably for some friends’ couches too). I would work on a new quilt for one of my nieces! Such a cute collection! Fun! I would make a baby quilt for my grandmother’s hope chest. Such sweet fabrics. Thanks for sharing. These would be great in one hour baskets or mug rugs or even pouch insides (what a nice surprise when they open up their gift)! Congrats on moving to Jax! Just north of you in Savannah. Lots of fun things to do and see there! Btw love your sewing room. Bright and sunny! I really loved your fussy cut block. Making pillows or a quilt like would be darling. I love this line! I would make something for my new little niece who is expected this fall! I’m new to sewing….i would like to make a zippered pouch with this pretty fabric! These are SO cute! I can see cute burp cloths and bibs for baby gifts. I can’t figure out how to repost on Instagram. I would make a few new makeup bags and pencil cases for my Daughter and her friends. I love throw pillows and definitely will try to make my first quilted pillows.